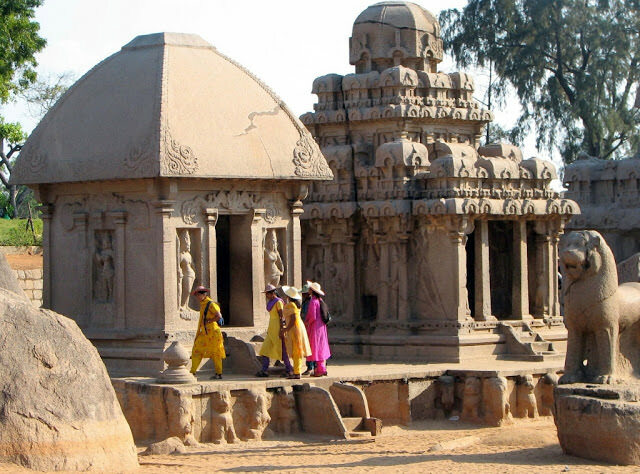 Three destinations in India are famous for their Monolithic Stone Chariots. Interestingly, all these three destinations are UNESCO world heritage sites too. They are - Sun temple in Konark Odisha, Stone chariot in the Vitthala temple complex Hampi and the Pancha Rathas of Mahabalipuram. On our visit to Mahabalipuram, we visited the "Pancha Rathas" or the five monolithic stone chariots of Mahabalipuram. Traditionally, Indian temples have chariots made of wood or metals which is used to take the chief deity out on a procession during the festival days. However, the monolithic chariots of Mahabalipuram was never intended for this use as they are stationary structures carved out of rock. The stone chariots, known as Rathas in local language were constructed more in a resemblance to temples, were each stone chariot has an entrance door leading to a niche, which houses a deity inside. The roofs of the Rathas are finely carved and the walls too have small niches were the images of Gods are carved into them. The Pancha Rathas are commonly known by the name "Pancha Pandava Rathas" meaning "the five chariots of the five Pandava brothers". Pandava brothers here refers to Yudishtira, Bheema, Arjuna, Nakula and Sahadeva from the Indian epic Mahabharata.The name of the chariots can be misleading. However, information board in front of this site clearly states that these monolithic chariots have no connection with the five Pandava brothers or the epic Mahabharata. 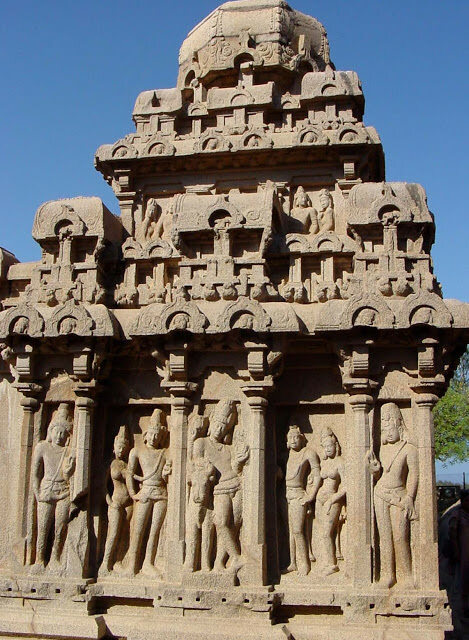 The five monolithic chariots are said to be built by Narasimhavarman I Mamalla - the king who ruled the Pallava kingdom of South India from AD 630-668. One interesting fact about these chariots is - four out of five chariots are located in a single line and their height gradually increases from North to South. This has lead the scholars to believe that these four chariots might have been carved out from a single gigantic rock in the shape of a Whale! The "Pancha Ratha" complex in Mahabalipurm houses five monolithic stone chariots by the name - Dharmaraja Ratha, Bheema Ratha, Arjuna Ratha, Nakula-Sahadeva Ratha and Draupathi Ratha. In these, Dharamaraja refers to the eldest of Pandava brothers - Yudhishtira and Draupathi was the wife of Pandava brothers. As we entered the sandy premises of the "Pancha Ratha" complex, the first thing that I noticed is the figure of an elephant. Even though, the elephant is not a fine creation compared to the chariots in the complex, it has some interesting features. The elephant is carved in a very coarse form, which a straight trunk and the rock between its legs is left behind without being removed. It shows that the elephant construction was not completed. It might also suggest that the Pancha Ratha complex was not fully finished and might have been abandoned due to some mysterious reasons. Next to the Elephant, we can find the Draupathi Ratha - or the Monolithic chariot of Drauapthi - the wife of Pandavas. Even though named so, the chief deity inside the chariot is Durga - a fierce Hindu Goddess. This chariot might have got the name of Draupati as it houses a female deity. This chariot is the smallest of all. The front side of the chariot features two female figures. They are the "Dwarapalikas" or the female gate keepers of the deity. In ancient south Indian temple structure, the sanctum would be protected by a set of gate keeper figures, who are symbolically guards the deity. Inside the chariot , we found the idol of Goddess Durga, standing on a Lotus. Two devotees are featured sitting near her feet, one is in a very strange disposition as he is about to cut of his own head as an offering to Durga. Though it seems quite horrifying, it was not a rare custom in ancient India.In the top half of the panel, we can spot the "Ganas" or the attendants of the Goddess Durga. As we walked around the chariot , we could see an image of Goddess Durga standing on the head of a buffalo.It is carved onto the external wall of the chariot . This represents the "Mahishasura Mardini" - indicating the victorious battle Durga lead to slain Mahishasura - a demon who could change forms as a human and a buffalo. Right next to the Draupathi Ratha, stands the Arjuna Ratha. In fact both these chariots share the same platform. I couldn't help but wonder - is the naming intentional? Arjuna was the one who was closest to Draupathi. Even though Draupthi was the common wife of five Pandavas, it was in fact Arjuna who succeeded the archery challenge and won Draupathi during her Swayamvara festival. There are remarks in Mahabharata that it was Arjuna that Druapathi loved the most! No wonder their chariots shared the same platform! The Arjuna chariot has an octagonal dome with two stages. It is more ornate than the Draupthi chariot. One of the artifact of interest on the platform is an object which looks like a finial. From what it appears to be, it is the finial that was supposed to be placed on the octagonal dome of the Arjuna chariot, however due to mysterious reasons, it was not being placed. 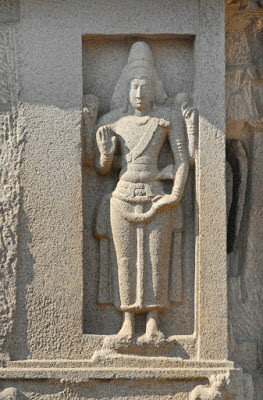 It is indeed interesting to think why the Pallava sculptures would leave such a key component behind! The inner sanctum of the Arjuna's chariot is empty, however according to scholars it is assumed that the chariot might have been dedicated to Shiva as a head and Thrisula symbol was found inside the sanctum. Arjuna Ratha - The finial that was never placed on the top of Ratha is resting on the right side. The external walls of the Arjuna chariot is richly carved with various figures. On one side we find a central figure of Subramanya about to mount on his vehicle - the elephant. On to the left of it, we can see the sculptures of two ladies with elegance and grace. They might depict the Apsaras . On the right side we can see a sage with his disciple. On either sides of this wall, we can see two Dwarapalakas or gate keepers, with raised hands possible holding some kind of a weapon. Another wall features the Shiva about to mount his vehicle Nandi - the bull. This could also be Krishna, and on either side we could see the so called donor couple, who might be the patrons of the chariot. On the outer niches we can find the gate keepers. It is customary in ancient Indian temples to have the vehicle of the deity near the temple. 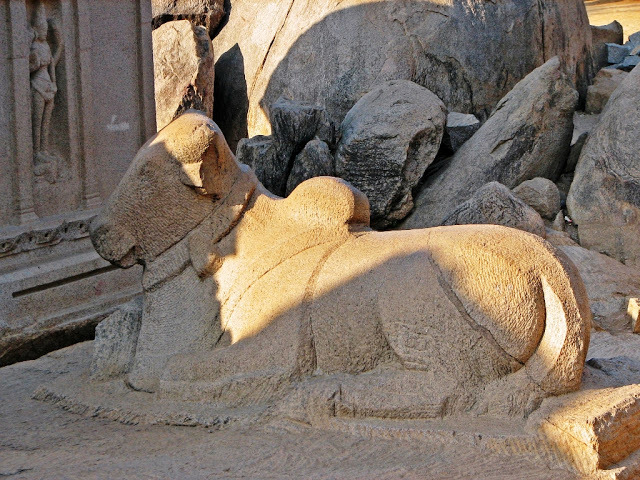 Nandi - the bull - is carved on to rock which is placed at the rear side of the Arjuna chariot. This also makes it clear that this chariot was originally dedicated to Shiva. Right next to the Arjuna chariot, another huge chariot is located. This is popularly known as the Bheema Ratha. Bheema chariot is the largest of the five chariots and has a bulky appearance. The epic Mahabharata says Bheema was the strongest and gigantic of Pandva brothers. This mighty aptly be the reason for naming this huge Ratha as Bheema Ratha. The Ratha has two stories and it is quite long. Some scholars suggests that this unfinished chariot might have been intended to house a gigantic "Ananta-shayana" or "Vishnu in cosmic sleep" idol. Even though the top part of the Bheema chariot is finely carved, the lower portions are relatively unfinished. Four pillars supports the bulky roof of the Bheema chariot, which has lion carvings at the bottom. The bottom part of the chariot, has been marked for making some sculptures but has been abandoned. 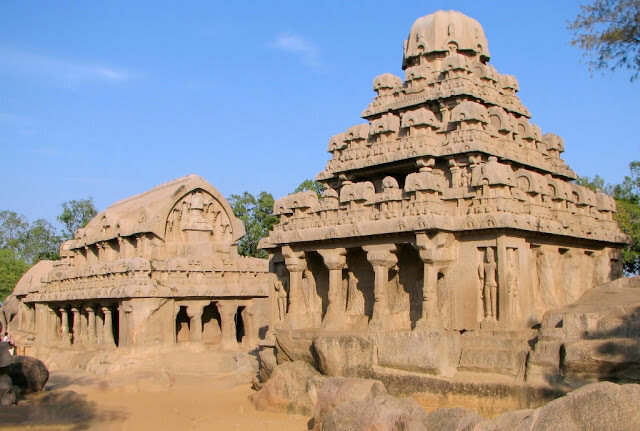 It is quite a perplexing question that under what circumstances that the sculptures of Mahabalipuram had to be left unfinished, it might be an enemy invasion, or a change in administration. The last chariot in the line is known as the Dharamaraja Ratha. This chariot stands at the highest position and hence might have named with the eldest of Pandava brothers. Like the Bheema Ratha, this also is unfinished towards the bottom part. One thing is evident from this structure is that the Pallava sculptures used to start their work from the top of the rock and worked their way down. We can observe in all of the chariots that the top part is neatly finished and it is the bottom that is unfinished. 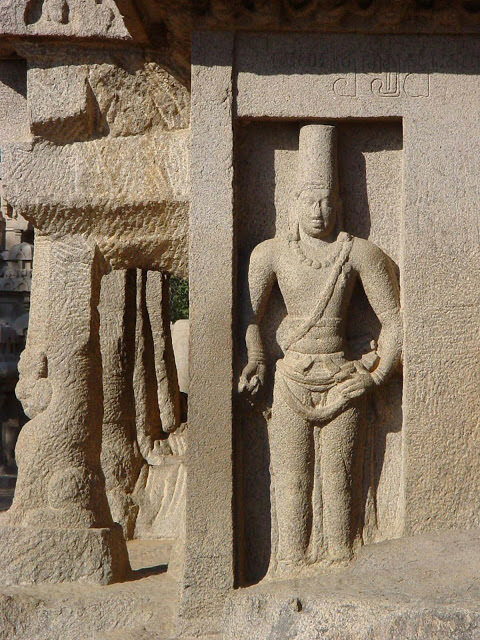 Dharamaraja Ratha is particularly of interested due to the bas-reliefs in the exterior walls. One of them depicts Lord Shiva in a very different way. This Shiva idol has a raised hairdo in the form of a coronet. In Sanscrit it is known as "Jata Mukuta". Some scholars believe that this is the Bairava form of lord Shiva. Another bas-relief on the Dharmaraja Ratha has a great archaeological value. It is the carving of a king, who wears a long crown and beads necklace around his neck. The sculpture has only two hands, suggesting that it is the carving of a human and not a God. An inscription above this bas-relief is of great interest to archaeologists and scholars. The inscription is read "Antyantakama(whose desires are boundless)" and "Anekopaya"( One who has many ways) which are believed to be the titles of Narasimhavarman Mamalla I. Due to these inscriptions, it is believed that the main patron of the Pancha Rathas is Narasimhavarman Mamalla I. However there is divided opinion among the scholars regarding during the reign of which Pallava king the chariot construction was started. On another side of the chariot, we can see the bas relief of Lord Bhrahma, with three heads. On closer observation, it is clear that the right face was not complete. Another wall depicts the Hari-Hara a form that combines Shiva and Vishnu. Another very interesting bas relief on the Dharmaraja Ratha is that of the "Ardha-Narishwara". It is a concept in the Indian mythology, were Lord Shiva and his wife Paravathi shares a single body. The bas relief is as interesting as the concept itself as both the male and female parts of it is carved out with exact features and the they unite with grace and elegance. 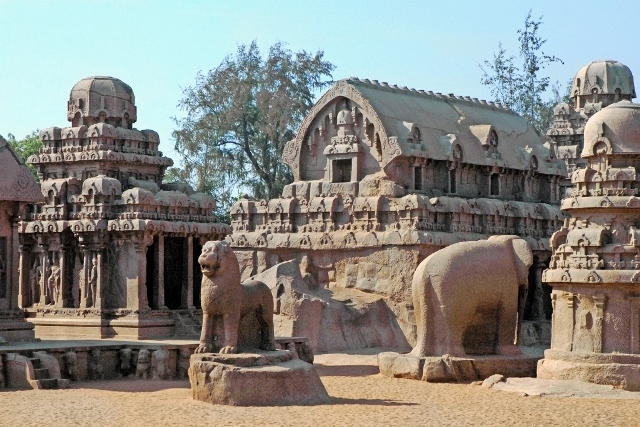 The fifth and final chariot of the five monolithic stone chariots of Mahabalipuram is called the "Nakula-Sahadeva" Ratha. Nakula and Sahadeva were the youngest of the five brothers. This chariot stands apart from the other four. It is clear that this chariot was constructed in a separate rock boulder that stands opposite to the the Arjuana chariot. It is believed that this chariot was dedicated to lord Indra due to the placement of elephants outside the chariot . Elephant is the vehicle of Indra and as mentioned before, it is a custom of ancient Indian temple to place the vehicle of the chief deity just in front of the main sanctum. Right next to this chariot we can find the coarsely carved life size sculpture of an elephant. A vivid description. Perfect. I am sitting in Dehradun but could feel that all these chariots were in front of me and someone from the ancient era, maybe the architect of these chariots is explaining the details to me.